It has been 5 years since the credit crunch that led to the global financial crisis, which eventually fed into the sovereign debt crisis across Europe, started. 5 years and 5 summers that policy makers and politicians have been struggling to contain one of the worst economic crises the world has seen. One can excuse them for feeling a sense of fatigue. Unfortunately, the challenges do not seem to go away so these very politicians are spending another summer break trying to deal with the same problems. A lot has been done, especially with regards to the sovereign debt crisis in Europe. Measures to assist indebted nations have been adopted; hundreds of billions have been invested to prop up the European banking sector; legislative measures have been put in place to strengthen economic governance. But is it enough? Greece remains a thorn on the side of the eurozone. The programme of austerity induced fiscal consolidation is stifling the economy. GDP is shrinking, unemployment is rising, tax receipts are well below projections. At the same time reforms are not moving fast enough and the population, exhausted from the barrage of cuts and belt tightening, mistrusts a political class that has long run out of good will and political capital, both at home and abroad. More and more voices are loudly speaking of the possibility (or inevitability) of a Greek exit from the eurozone. Like another Ifigeneia, its sacrifice is hoped will appease the gods of the financial markets. But such a move will be nothing less than a temporary fix and, as the past few years have shown, such fixes are short lived. A Greek default (and exit from the eurozone) might remove one headache but will add several more. First of all the cost will be considerably high (the Economist has calculated it to about €320 billion). Most of that will be underwritten by European tax payers. With private bondholders having accepted a huge haircut a few months ago, most of the Greek liabilities are held by the European Central Bank, European central banks and member states themselves. The financial and, above all, political cost will be enormous. The other factor is the much talked about issue of contagion. Financial markets remain highly insecure and confidence in countries like Spain and Italy, despite their colossal efforts to reform their economies and reduce their debts, is still low. A Greek exit will not draw the line under the crisis, it will open the Pandora’s box, unleash speculation and increase the pressure on sovereign debt and the European banking sector. 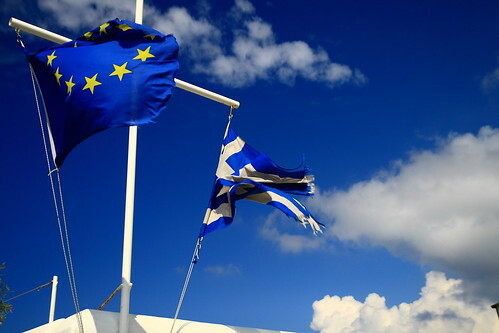 The stakes are too high to toy with a Greek exit, desirable (or even deserved) as it may appear. Greece is nothing but the bush of this crisis, focusing on it means missing the forest. Market participants, investors, EU citizens have been all along asking for certain, long term, structural remedies. For far too long those remedies have been delayed. Time waits for no one and no more than ever the pressure is on. A clear roadmap is needed, one that commits the eurozone in long term institutional reform. Both economic governance and financial supervision must move to the European level. Sovereign debt must be dealt with in its entirety and not in a piecemeal fashion. Mutualisation must be part of the mix. Centralisation of decision making must be coupled with greater participation in the decision-making process by the European Parliament, national parliaments and of course the European electorate. As the summer closes to an end it is high time for brave decisions, for confident steps forwards, based on concrete policy foundations and in consultation with EU citizens. The eurozone cannot stay much longer in this halfway house. It is hard to predict what the future holds but as Georg Christoph Lichtenberg said, “I cannot say whether things will get better if we change; what I can say is they must change if they are to get better”.